In February, I traveled with board members to Batahola to reconnect with the Center’s staff and students. Being at the Center energizes me. It does such positive, good, uplifting work. 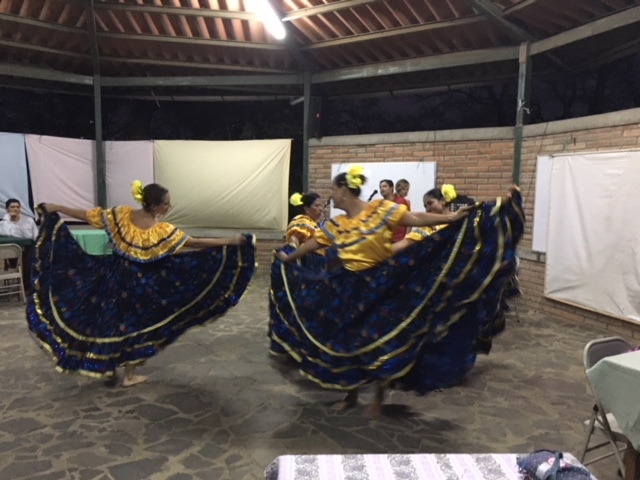 One evening we were treated to student performances by the New Dawn Dance Group, the Ángel Torrellas Choir and the Margarita Navarro Youth Orchestra. One impressive young woman, Ana Sánchez Narváez, performed a violin solo. Before her solo, Ana spoke to the audience. 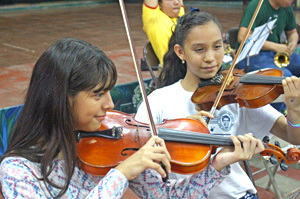 She said she found her purpose at the Center through music, playing the violin. She said she’s achieved what she has because of the support of her teachers, Friends of Batahola, and the Center’s scholarship program. And then, she made a big announcement: She had been selected to continue her music studies at the University of Costa Rica. Such joy for her! And, for me? Well, I was energized yet again by witnessing how the Center impacts the lives of students. 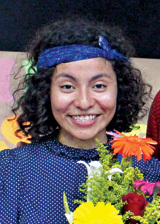 You can read more about Ana here: It's Off to College for Scholarship Student. Her story is one of many stories of students whose lives have been turned around by the many programs the Center offers. 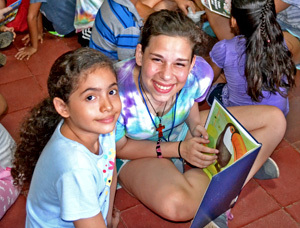 These programs are supported by your generosity, our donors. It’s not always possible to see directly the benefit of your donation, but I hope Ana’s story gives you a glimpse at the opportunities the Center provides…and the successes that are achieved. Your generosity makes a difference, and I thank you for your support. Staff Accountant Gleris Ruiz Loredo breaks ground on the keyhole garden. The drought is palpable in Nicaragua. The land is dry and cracked, there is little refuge from the sun, and all but the most stubborn plants have decided to vacation in their root systems. As a result, food prices have gone up, and vegetables are disappearing from meals. The Center decided to take a stand against the drought, which started in 2014, by creating a keyhole garden in its north corner. Keyhole gardens originated in Africa. They are drought-resistant and can be constructed from items found in the immediate vicinity. Two volunteers from Canada are supervising the endeavor. They initiated an awareness campaign about keyhole gardens and explained why home gardening is important. Then they encouraged staff and students to bring in materials from their homes to help build the garden: rocks, sticks, dirt, cardboard, ashes, iron scraps, dry bones, whatever was readily available. Art students paint vases to decorate the garden fence. A few days later, the work began. Stone by stone, stick by stick, the volunteers, staff, and students lent their hands to create their own vegetable keyhole garden. Even the youngest students participated by adding their artistic flare. 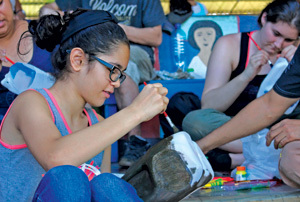 Art professor Gerardo Arias had students paint flower vases made out of recycled materials to hang on the garden fence. Jennifer Murtoff’s life passion is music. “Music is something I have to do. Part of my soul can’t speak unless I’m playing music or singing,” she said. Jennifer is an amateur classical musician. Her instrument is the French horn. 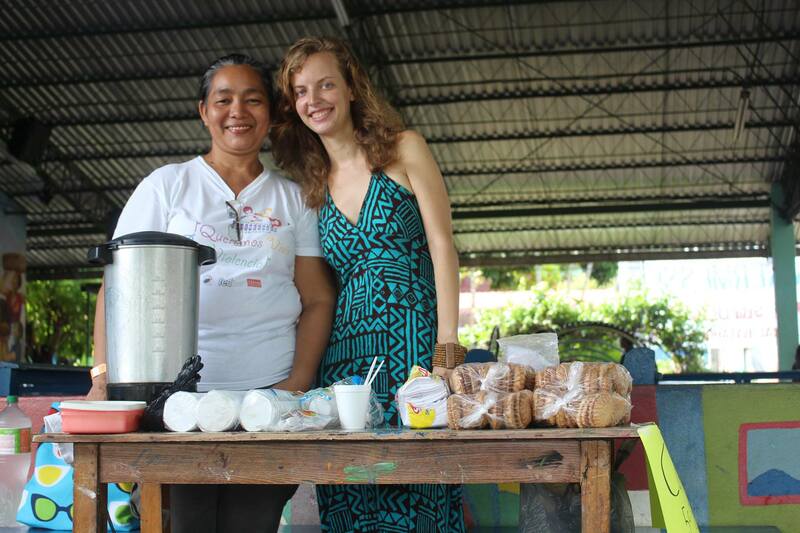 Her college studies in Costa Rica led her on side trips to Guatemala and Nicaragua…and eventually to the Center. 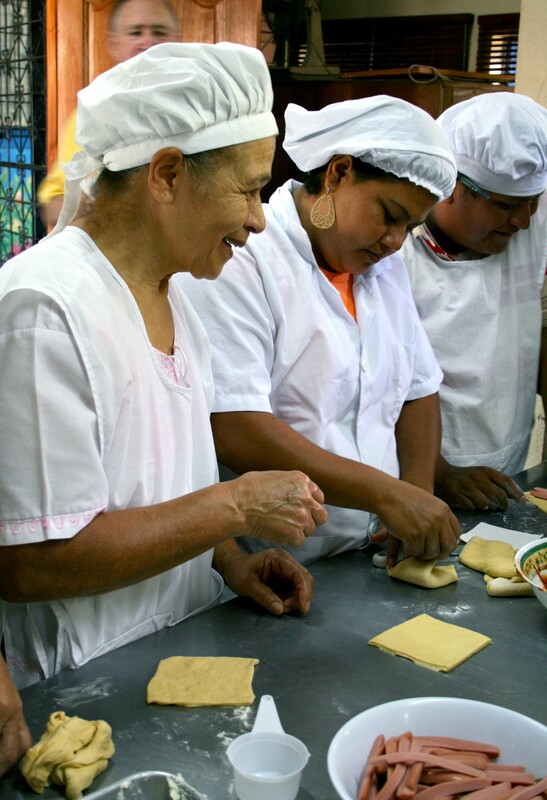 Arriving in Nicaragua, Jennifer was stunned by the level of poverty. 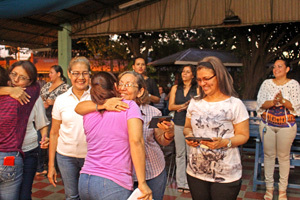 She was assigned to the Center as part of a service-learning opportunity and was housed with two single mothers and their three children who were connected with the Center. There were two beds, she said, and the women gave her one, while all five of them slept in the other. Rodents danced on rails above their heads during the night. “The abject poverty, well, it opened my eyes a lot,” she said. Jennifer’s 2015 donation was used to purchase strings, resin, bows, violin cases, and other accessories for the music program. Claudia Mercado is the Center’s Arts and Culture Promoter. Music, Jennifer said, gives the students at the Center something beautiful, some ray of hope, some bright and cheerful place to go to in their hearts and minds. 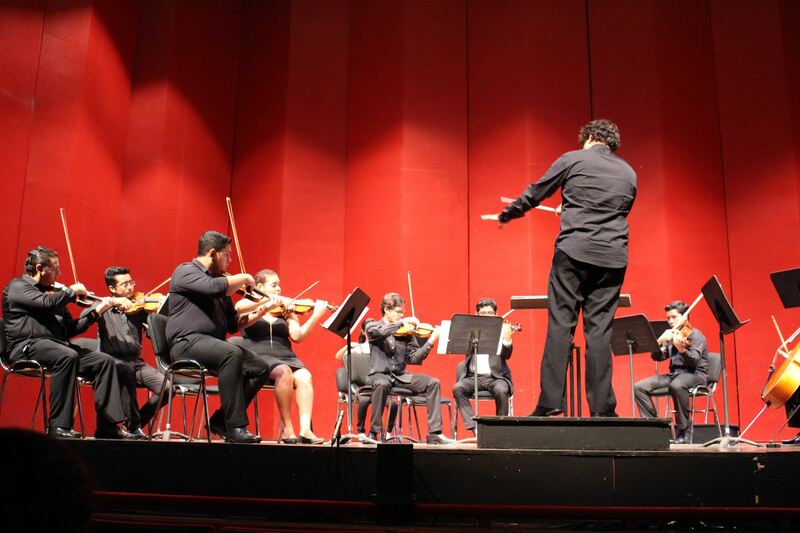 Ana, a scholarship student, has taken music classes and individual violin classes, and she has performed with the Center’s choral and orchestral groups. 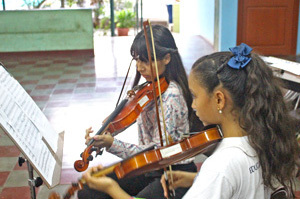 For her service hours, she teaches violin classes to younger students at the Center. 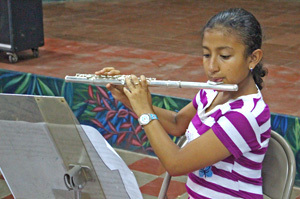 Now, through another scholarship received from the Center, Ana is headed to the University of Costa Rica and its prestigious School of Musical Arts. We wish Ana much success as she pursues her studies. If you’d like to contribute to the work of the Center, make a donation today by clicking the Donate Now button above. Together, we’re rebuilding students’ lives. Donate to this hope! 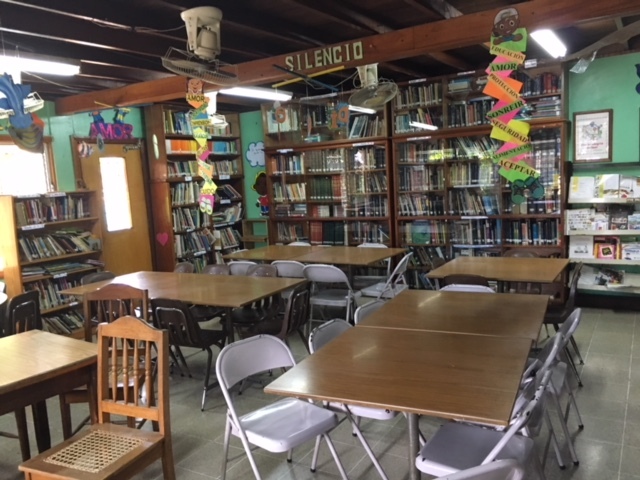 Students taking English classes are introduced to the Center’s library. It’s a tremendous resource for our English students, and all the other students, at the Center. 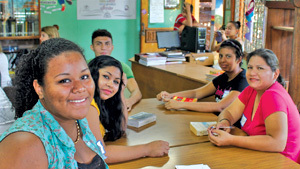 Thirty-three new students signed up for English classes which began in February. The classes, taught by Friends of Batahola volunteers, Natasha Hansen and Clare Morrison, are becoming quite popular. This year’s students include a 12-year-old, as well as a security guard at the U.S. Embassy in Managua. Learning to speak English opens doors to better opportunities and higher-paying jobs for students. The Center has a long tradition of service, reaching out to others in need in both rural and urban communities. 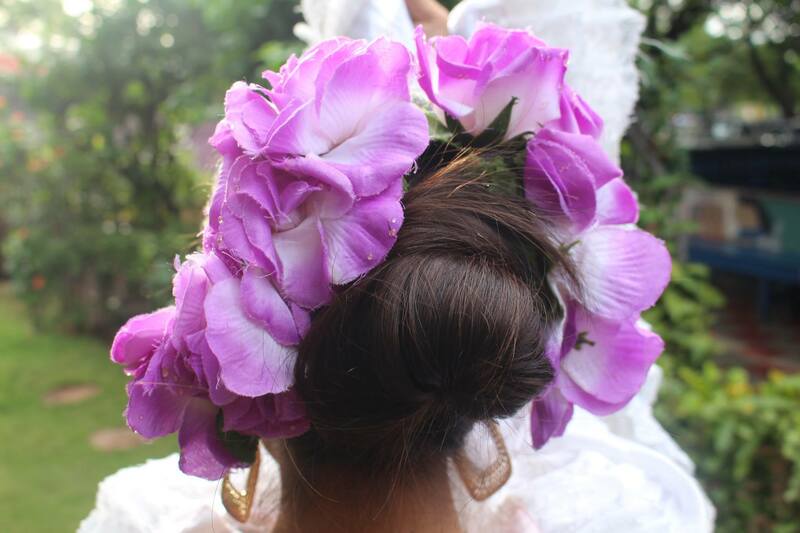 Twice a year, the Center’s cosmetology and handicrafts students visit rural areas, providing free haircuts and teaching women how to make crafts to sell. 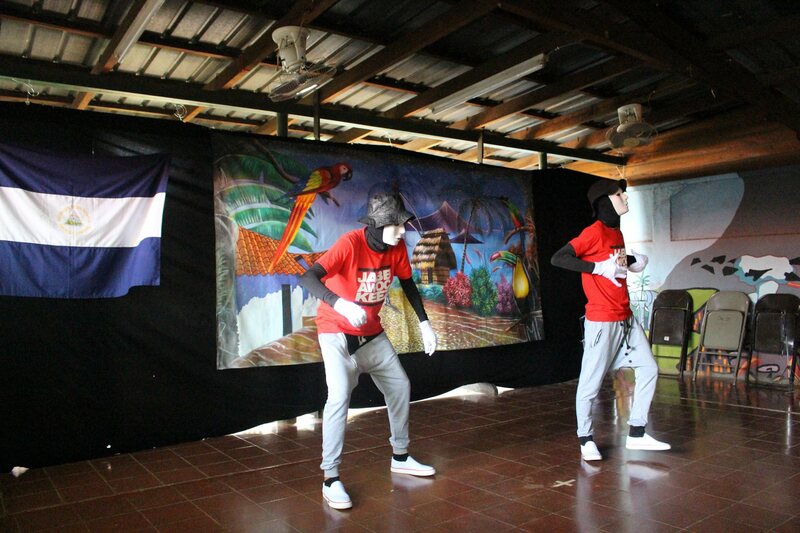 Last year, the arts and culture students performed three times for sick children at Las Mascotas Hospital in Managua. In 2014 when art instructor and mural painter Gerardo Arias was in the U.S., at the invitation of Immaculate Heart of Mary Parish in Cincinnati, Ohio, he attended a breakfast sponsored by ArtWorks Cincinnati. At the breakfast members of its Hero Design Company spoke about the healing power of art and how the company helps children facing medical, physical, and emotional hardships discover their real-world superpowers through the creation of personalized superhero insignias and capes. This gave Gerardo an idea! When Gerardo returned to Nicaragua and to the Center, he and his wife, Maria Eugenia, also an artist, started a service project to make their own version of the superhero capes for children being treated for cancer at Las Mascotas Hospital. IHM parishioner, Diane Detzel, whose sister works for ArtWorks Cincinnati, donated two containers of fabric for the project, enough to make 57 superhero capes! It’s just one more example of the generosity of a Friend of Batahola. Thank you, Diane! 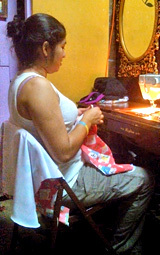 Maria Eugenia Arias sews a cape for one of the young “superhero” cancer patients. 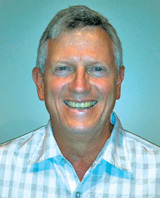 The Center sees service to others as a core mission. 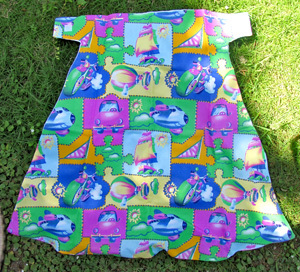 The fabric for the capes was donated by a Friend of Batahola. Before visiting the children, Gerardo and Maria Eugenia said they wanted to make their visits with the children extra special and gathered some resources to buy small gifts, such as toothbrushes, chocolate, and towels. Gerardo and Maria Eugenia plan to return to the hospital. Next time, he said, they want to bring other groups from the Center, so they can dance and play music for the children, as well. 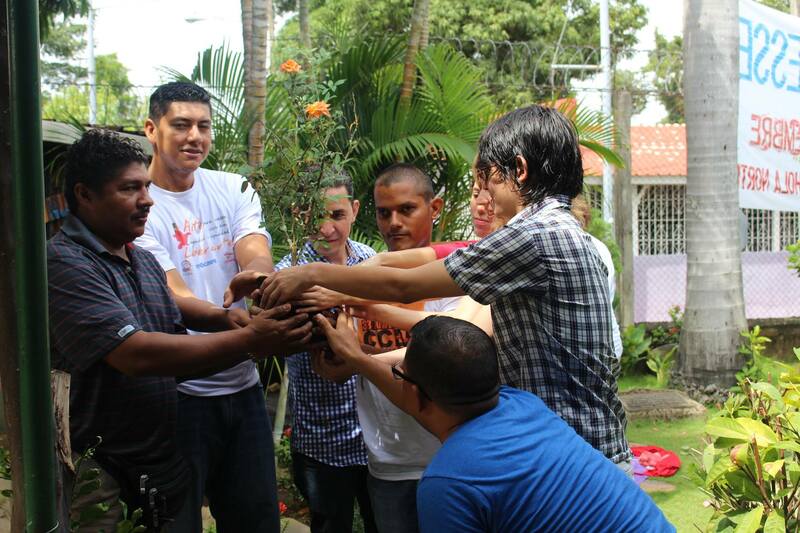 The spirit of service…reaching out to others who are also in need…is alive and well at the Center! 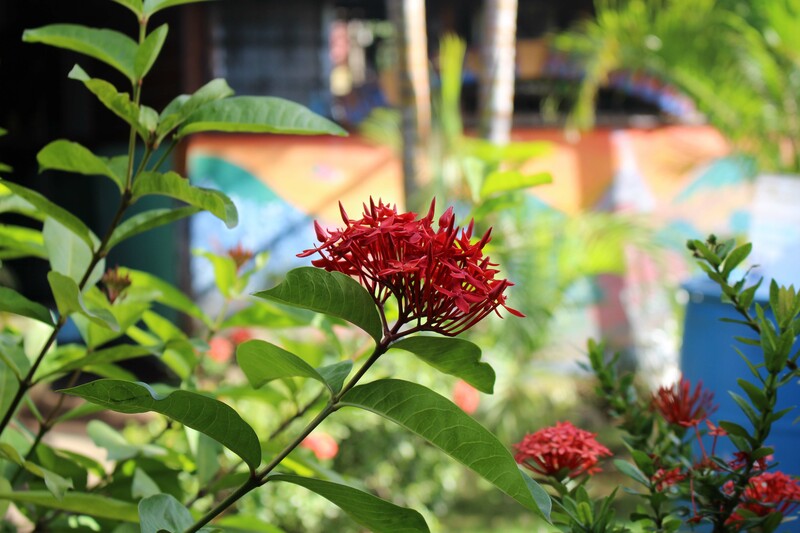 It’s yet another reason we’re proud to support the Center as Friends of Batahola. There’s a constant pulse of sound that pours out of the Center into Batahola and beyond. It’s the competing sounds of violins, guitars, flutes, and marimbas calling out to the community, inviting all to come and see who’s making such beautiful noise! 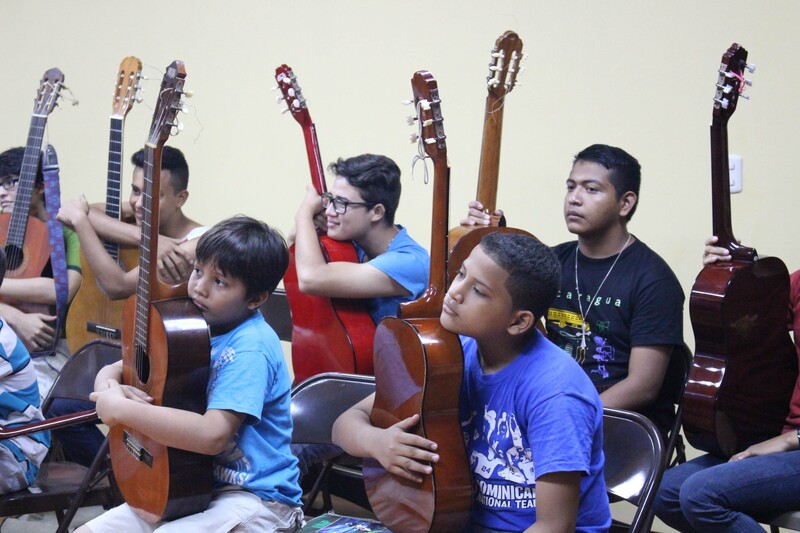 Each year, more and more students come to the Center asking to learn how to play an instrument. 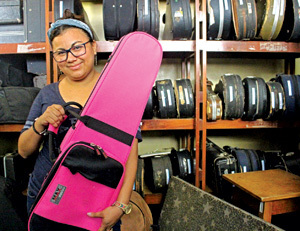 “It’s very difficult for most students to buy an instrument, let alone afford to maintain it,” explained Claudia Mercado, the Center’s Arts and Culture Promoter. That’s when Friends of Batahola supporters, like Jennifer Murtoff from Illinois step in to help. 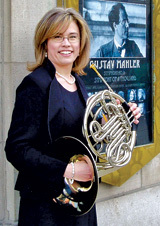 An amateur classical musician herself, she’s been supporting the Center’s music program for nearly 20 years. Her donation in 2015 allowed the Center to purchase strings, resin, bows, violin cases and other musical accessories. You can read her story of love, care, and concern for the Center and the music students here: Friend of Batahola: Jennifer Murtoff. Thanks to Friend of Batahola Jennifer Murtoff, and other donors like her, our music program continues to be inclusive, inspirational, and educational for all who hear the call to play. 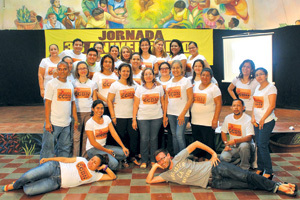 On March 3rd, the Center celebrated its 33rd anniversary with the theme, Women with a Legacy. 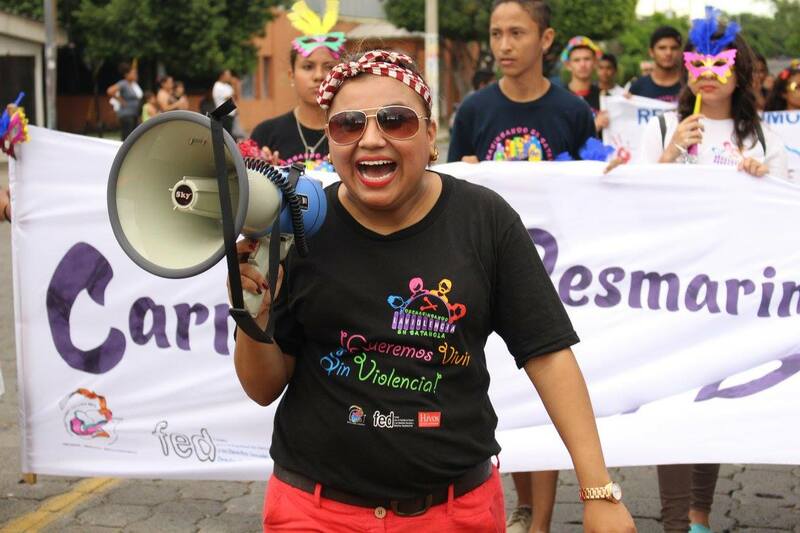 An entire week was dedicated to the celebration, beginning with a festival which highlighted the work of many groups at the Center, as well as the Center’s fight for violence prevention through art. Another event had the women from the community gather together in a circle of meditation. There were also games for the children. 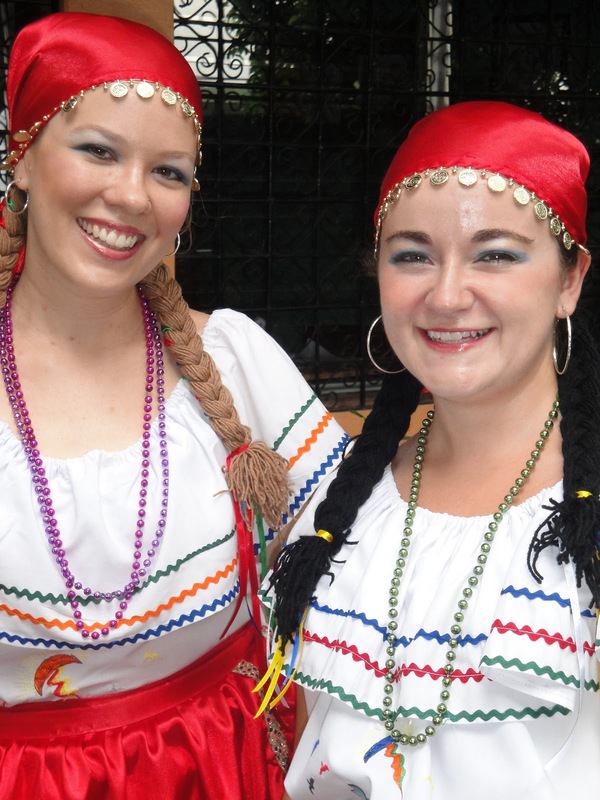 The week culminated in a festive cultural activity at a nearby park. And the four walls become a jail cell. A God who is with us in the struggle. And being a woman, you can do it, you have what it takes. Not only that you feel welcome, but welcome others too. Solidarity and camaraderie are expected. And we paint murals on the ruins. At the end of the group presentations, everyone gathered in a circle with lit candles to share hope and light. Through the efforts of those at the Center, the support of Friends of Batahola, and others who stand in solidarity abroad, we will sow the seeds of all our prayers and watch them bear fruit over the next 33 years! Together, we’re transforming lives! Please help by clicking the Donate Now button above. Thank you and blessings for your ongoing support. In short, the trip was overwhelming. From the second I stepped into the intense heat, I was surrounded by new things. Before coming, I had obviously seen pictures of poverty-stricken people. However, these lack the spirit of the people they show. Poverty finally has a face in my mind that I will never be able to forget. I need to help in some way, but I’m not sure how. One thing I know for sure is that my heart belongs to all the people I have met here. Words are not enough to describe the experience. What I have seen with my very own eyes, in one word, would be love. You expect the people and the environment to be sad and lonesome, but you would be surprised. The kindness and sense of community that I witnessed firsthand at the Cultural Center is beyond me. Everyone knows nothing but love to one another. It was the most eye-opening experience I will probably ever have. It changes your perspective and outlook on life. You feel emotions and have thoughts that have never occurred to you before. While poverty, distance, and injustice may divide us, love unites us. An experience like this moves us, shakes us (like a sand sifter), until suddenly we experience a new kind of “awake.” It is our choice to live without dead time. It is our choice to choose the road filled with crowded buses, feces, hustling of goods, poverty, rocks, chickens, and “adios.” It is our choice to say “yes” to the challenges this brings, the big questions that leave us wondering who we are, who we thought we were, and who we want to be. The trip has helped me get back in touch with some of my feelings and things I want to live for and see how people respond the kindness that I can give. I still have a lot to sort out to simplify. I would like to keep this “peaceful” feeling, hopeful feeling to share with others (including those close to me and those I interact with on a daily basis), so I can be the face of God to others. The trip helped restore my faith that doors will open to help in areas of education and empowering women. What do I live for? In the last phase of my life, I want to focus on those in need. I don’t want people to define me by my business career, that I am smart or a nice guy, but that I am a champion for social justice, that I not let comments about our brothers and sisters go unanswered. I want to see my grandchildren grow up with the values I see in their parents. I want to make my life a true example “that it is better to give than receive.” This trip opened my eyes (again) to God’s call to treat all people as I would treat my own family and grandchildren. That what people lack in possessions, they make up for with community and solidarity with each other. We need to take from them their love of God and each other and give to them a fair share of our bounty. Only when we are all truly brother and sister can we truly find fulfillment and joy! I saw the face of Christ in everyone around me. I met so many people that were so joyful, even though they had so little, I thought. In reality, these people had so much. They had big hearts and souls filled with faith and joy. They welcomed us into their homes, into their hearts, and into their lives. Their simple lifestyle was very hard on me the first few days, and I found myself counting down the days until I could go back to my normal life. After a little time, I began to love the simple lifestyle. I want to live my life as Jesus did and Jesus lived his life for everyone. I know I am not going to be able to help everyone, but if I could just help a handful of people, or even one person, I know I would have lived my life the way God wanted me to. The trip for me was a trip of a lifetime. We met so many wonderful people, saw some indescribable sights, learned some pretty awesome dance moves, and, somewhere along the way, became a big happy family. During the trip, I saw God’s work firsthand, and, saying it was incredible doesn’t come near to doing it justice. It helped me realize true happiness and appreciate everything I have and all that I have to live for. I’ve made some pretty amazing relationships that I hope to keep for a long time. And, I’m so grateful to all of the chaperones and everyone who made the trip possible. You’re some of the most inspiring people I’ve ever met.